Nature has a history of vandalizing Olivewood Cemetery, in the guise of erosion and hurricane damage. 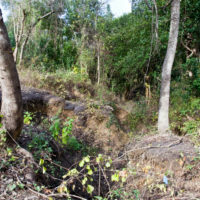 Drainage to White Oak Bayou has taken away several of our gravesites, and Hurricane Ike toppled several old and stately oaks on top of fragile headstones. We thank the City of Houston for helping us remove some of the greatest Ike damage but there is still a lot of debris that needs to be removed. We have worked with CARI to exhume several sets of remains from one of the eroding ravines. We also thank our neighbors at Grocer’s Supply for helping us with some drainage issues and hope to work with them in the future in continuing to remediate our erosion issues. As the neighborhood surrounding the cemetery continues to evolve, Descendants of Olivewood is working with the City of Houston, TIRZ, the Houston Parks Board, and the developers at Capcor, LLC to ensure that past drainage and erosion problems do not continue with future development. We are especially thankful for the volunteers who have come since the recent flooding to help in the clean-up and maintenance process.